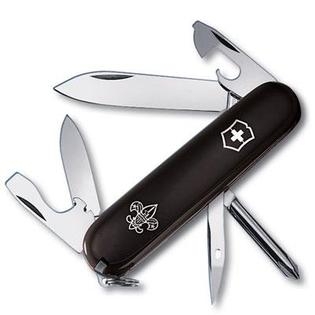 Victorinox Tinker Boy Scout. 3 1/2" closed. Large blade, small blade, Phillips screwdriver, can opener with small screwdriver, bottle opener with screwdriver and wire stripper, reamer with sewing eye, toothpick, tweezers and keyring. Handle has Boy Scout logo. Black handles.